Have you been eating enough greens lately? If not, this Southwestern shrimp salad recipe is for you. It’s a cinch to make and super satisfying. Anyone who’s seen my Instagram feed knows I subsist on salad. 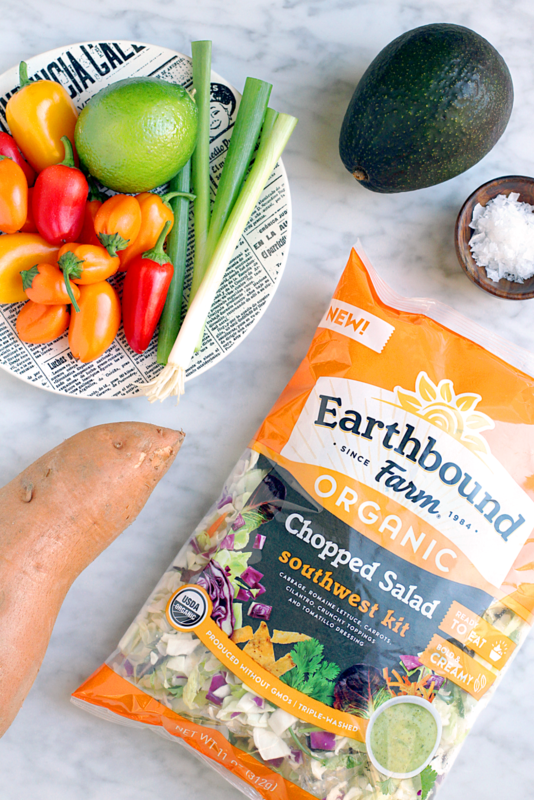 So when the TheFeedFeed team reached out and asked if I’d like to try Earthbound Farm's Organic Chopped Salad Kits, I immediately replied, “Yes please!” I’m a creature of habit, but I always welcome new ways to spice things up in the kitchen. Inspired by the Southwest kit, I came up with this colorful creation, which features seasonal produce and one of my favorite sources of protein: shrimp! Because the salad kit includes a variety of greens, toppings and dressing, meal prep is a breeze. Follow a few simple steps, and you can get food on the table in about 30 minutes. Feel free to get creative when building your Southwestern shrimp salad. Sub in butternut squash for the sweet potato and use fresh versus frozen corn, if they’re in season. You can even finish the dish with a sprinkling of queso fresco or a spoonful of black beans. While I used the Southwestern kit for this recipe, the kit also comes in BBQ Ranch and Organic Asian! Cooking for one instead of three? Prepare everything anyway and simply plate up a single serving. Then store the leftover ingredients in the fridge. 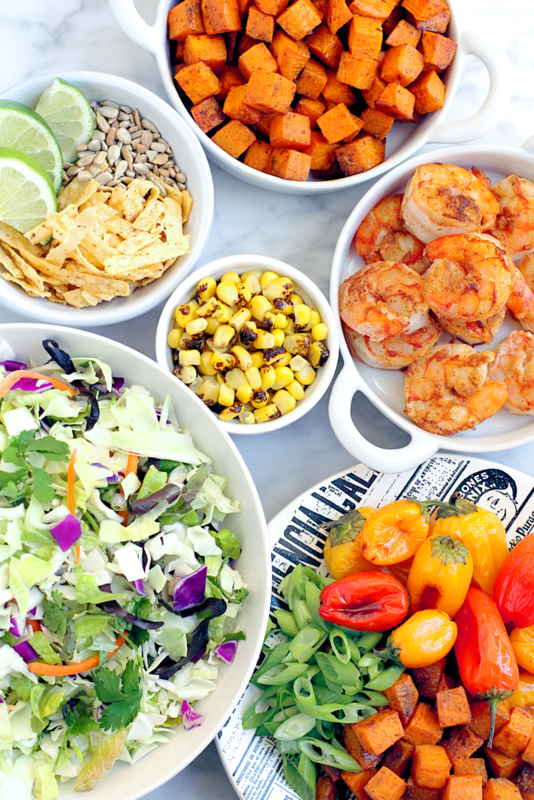 When hunger strikes, you can assemble another Southwestern shrimp salad in a matter of seconds. In a small bowl, combine all the spice blend ingredients. Place the mini peppers on one side of a baking sheet and the sweet potato on the other side. Drizzle with 1 tablespoon olive oil and season with 1½ teaspoons Southwestern spice blend; toss to coat. Arrange vegetables in a single layer and bake for 10 minutes. Remove from the oven, stir gently and bake for 5 minutes. Remove peppers from the oven and bake the sweet potato for an additional 5 minutes. Remove from the oven and set aside. Season shrimp with remaining Southwestern spice blend. Heat remaining 1 tablespoon olive oil in a fry pan over medium-high heat. Add shrimp to pan and cook for 1-2 minutes on each side until opaque in the center. 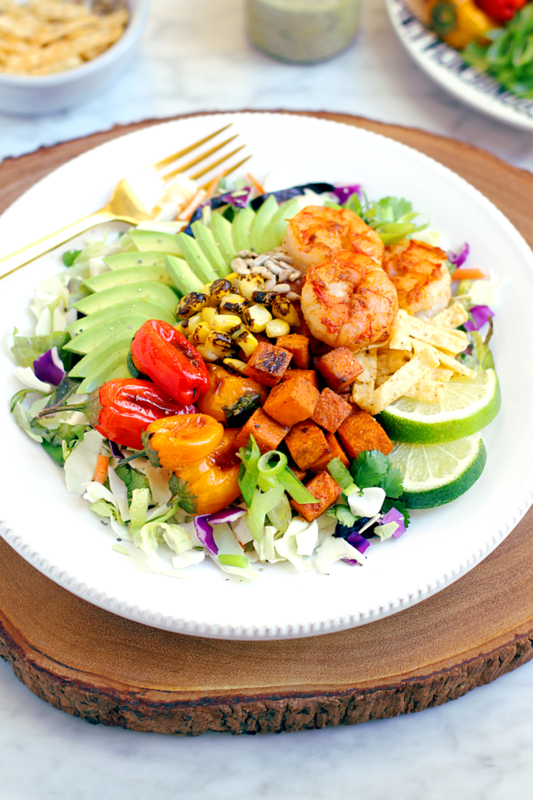 Divide and arrange greens, roasted mini peppers and sweet potato, pan-fried shrimp, avocado, corn, green onions, crunchy topping (included in the salad kit) and lime wheels among three salad plates. Drizzle tomatillo dressing (included in the salad kit) over salad and season with salt and pepper.